The Director is KAB's number one seller and provides top value for money and maximum reliability. 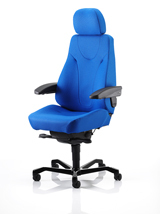 It is a versatile chair, ideal for senior personnel, workstation and heavy duty environments. Buy the standard KAB Director online here in your choice of the following Xtreme fabrics, £586.80 + vat (UK mainland addresses only).